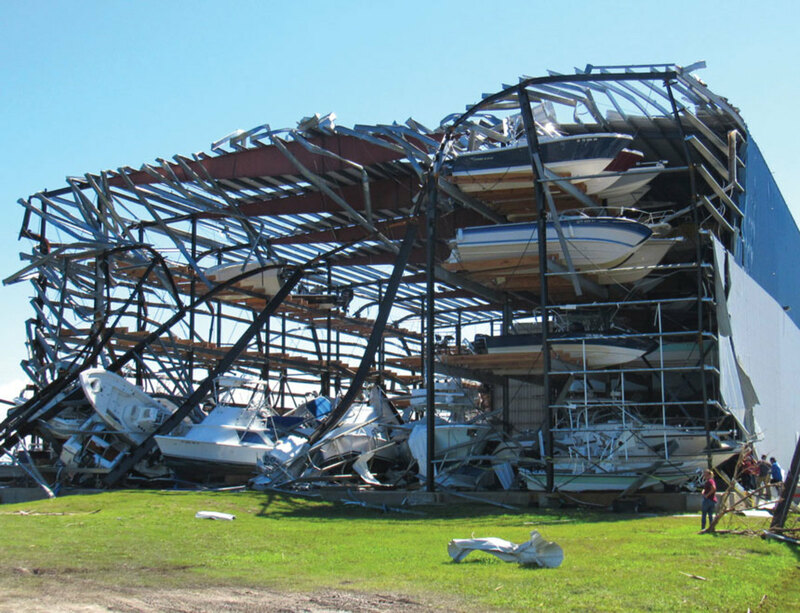 Hard-hit Cove Harbor Marina & Drystack in Rockport, Texas, was still rebuilding docks and storage facilities in late June. The United States experienced a historic year of weather and climate disasters in 2017, with 16 catastrophes costing $306.2 billion, shattering the record of $214.8 billion set in 2005. That year’s record damage was attributable to hurricanes Dennis, Katrina, Rita and Wilma. Last year’s spike was largely due to Category 4 hurricanes Harvey and Irma, which slammed Texas and Florida, damaging more than 63,000 recreational boats for a combined estimate of $655 million. It was the first time two Category 4 hurricanes hit the U.S. coast during the same year since data collection began in 1914. A year later, the impacted communities are still recovering. Irma destroyed many trailers and other affordable housing in the Florida Keys, and advocates and officials expect few residents to return. “Folks are living in unlawful spaces that don’t meet code, unsafe spaces, and they have been doing it because they want to be there and it’s the only way they can afford to be there,” Jaimie Ross, president of the Florida Housing Coalition, told Reuters. “I’m estimating between 15 and 25 percent of our population is going to be lost, and we lose more and more every day,” Monroe County commissioner George Neugent told the wire service. Cooper Capital took over an area near the marina’s wet slips to auction totaled boats, and nearby Key Allegro Marina’s most recent post asks boaters not to attempt to access the facilities. Dolphin Marina and Cottages on Little Torch Key will be closed for at least another six months, according to Florida Keys News. Irma destroyed the dockmaster’s office, fuel dock, cottages and main office. NOAA forecasted a 7 percent chance for 10 to 16 named storms this year, with five to nine becoming hurricanes. A design team was named in late June to help plan the reconstruction of Seaplane Base and Marina in Tavares, Fla., according to the Orlando Sentinel. The St. Augustine Municipal Marina is offering a “limited number of slips” with shore power and water for overnight dockage, but no long-term dockage. Sunshine Key RV Resort & Marina in Big Pine Key is still wiped out, Freestone says, and Bahia Honda State Park in the Keys in June was still working to recover. The marina is offering the use of ramps, but overnight stays are closed while repairs are ongoing. The Houston Boat Show, which ran June 13-17, was up about 12 percent in sales. Part of the increase was due to people replacing Harvey-damaged boats, says Ken Lovell, president of the show. “Some dealers reported selling 70 or 80 boats during the show,” he says. 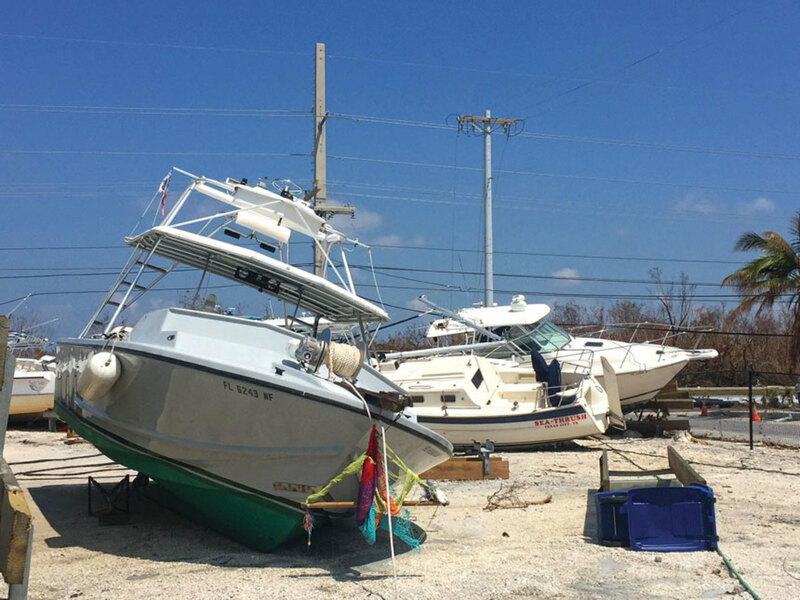 With another hurricane season looming, it’s important for people to have a game plan, says Kerry McCook, senior supervisor of property claims at BoatUS. “It’s important not just for the boat, but to have a plan for your home and family, especially if you’re in an area that’s prone,” McCook says. When a storm is five days away from potential landfall in the Keys, Freestone begins shuttering businesses and boarding houses, a plan that was implemented after Category 2 Hurricane Georges hit in 1998. Though Freestone is hopeful another storm won’t hit the region this year — “I don’t know what we’d do,” he says — his TowBoatUS franchise has added equipment to double its salvage capabilities.